Christopher Charles Collins (born Christopher Lawrence Latta, also known as Chris Latta) was an actor, voice artist, and comedian. He was born in Orange, New Jersey on August 30, 1949 and died on June 12, 1994 due to illness. 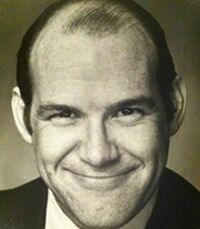 Christopher Collins is best known for voicing Cobra Commander in the Sunbow and DiC series of G.I. Joe: A Real American Hero, Starscream in The Transformers and as the original voice of Moe Szyslak from The Simpsons. He played King Koopa in King Koopa's Kool Kartoons. After he left the show, the role was given to Patrick Pinney. This page was last edited on March 15, 2018, at 12:34.